I’m sure you’ve heard of aloe vera use for healing wounds. And you’ve likely seen products galore in convenience stores containing aloe vera as a promotional feature of the product. Healing acne is only one more benefit of aloe vera, especially in the area of skin. Aloe vera has been scientifically proven to treat a host of conditions: burns, radiation therapy, wound healing, genital herpes, psoriasis, seborrhea, diabetes, and other conditions. The aloe plant is a common houseplant and is a member of the lily family. 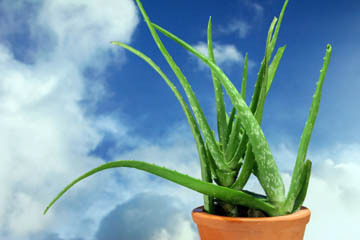 Aloe vera is the most recognized species of all aloe. The gel from its leaves has been used throughout the centuries in different cultures to heal wounds, burns, and scars. Today, the gel is still used directly from its leaf, although it is more commonly featured as an active ingredient in various skin products, creams, makeup, and lotions. In one study of aloe vera use as a lotion (30% concentration), patients with seborrheic dermatitis found their skin condition improved after applying the lotion to their skin daily for 4 to 6 weeks. Source: Medline Plus. In another study that was published in 1996 in Tropical Medicine and International Health, researchers found that aloe vera was very effective when treating psoriasis. After 16 weeks, the cream with aloe vera extract significantly helped to clear psoriasis in 25 of 30 patients, compared with 2 of 30 patients who were given a placebo. So aloe vera certainly works for some skin problems, but does it really work for acne? 1. Aloe helps absorption of other ingredients into the skin. Lignin is a component of aloe that helps other ingredients of topical creams or gels, penetrate into the skin. Using aloe vera in combination with other active ingredients, for instance, benzoyl peroxide (BP), would help to accelerate the absorption of BP into the skin and kill the acne bacteria. 2. Aloe has antiseptic properties. 3% of Aloe Vera gel is composed of saponins which are soapy substances that cleanse and have antiseptic properties. They also act effectively as anti-microbials against bacteria, viruses, fungi and yeast. 3. Aloe vera gel has anti-inflammatory properties. Aloe vera contains salicylic acid that has anti-inflammatory and anti-bacterial properties. This makes it very useful against acne. 4. Aloe vera has enzymes. Enzymes like Bradykinase, help to reduce excessive inflammation and consequently reduce pain. Other enzymes help digest any dead tissues in wounds. You can find many different products with aloe vera as the active ingredient. You can find soaps, gels, lotions, creams, cleansers, and other products. Aloe vera may not eliminate your acne entirely, but it is fairly gentle on the skin, and will decrease redness, inflammation, dryness, and swelling. Recognize that not all brands are created equal, and that when looking for a good aloe vera product, the effectiveness of these brands will vary. You may need to do some trial and error testing until you find a good product that helps ease your acne. There are no known side effects to using aloe vera topically. Most of the above information has been focused on the uses of the aloe vera gel found inside its cactus-like leaves. But the skin of these leaves can also be used for other medicinal and health benefits. The skin can be used in a drink as an aloe juice benefit to form drug aloe or aloes, which is a sticky substance. This can be used as a laxative or for detoxification purposes. To get your acne under control immediately click here now. Want more information on Aloe Vera Use? Sign up for my free newsletter.